I’ve had the chance to play it twice over the weekend – one a “quick” game, and the other a “standard” length game… there was certainly nothing quick about either length. There seems to be some mechanics I’m a little dubious about, but all in all we all had a lot of fun, and it is really quite a good game. I actually walked away from the table feeling like I had to compare it to Game of Thrones (GoT), but perhaps that is just due to the length. As I have said before , GoT always takes my group over 6 hours to complete. 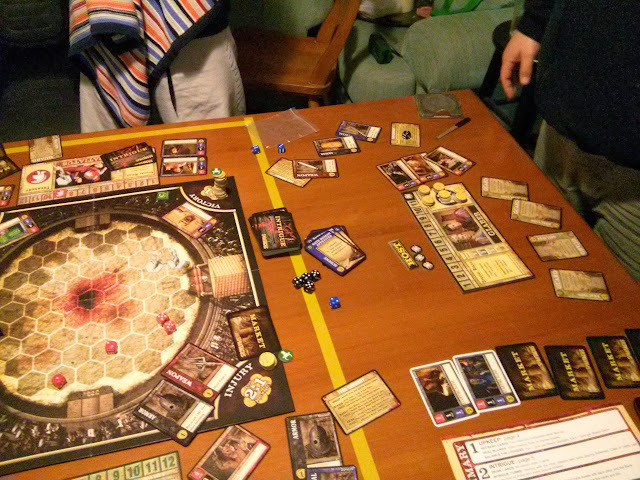 Spartacus’s “quick” game (which, in our defense, was our first) took somewhere around 4 hours, and the standard around 5 or 6. The big difference between Spartacus and GoT, though, was with Spartacus I walked away not regretting those hours. So let’s look at Spartacus in some depth. The game is designed to allow plenty of back stabbing and betrayal, but like GoT I didn’t really find that was the case. I maintain that for there to be any meaningful betrayal you need to believe the betrayer is on your side – until the sudden but inevitable, of course. In both GoT and Spartacus there can only be one victor, so you can only ever secure one-shot agreements. It’s more like trade. “If you attack him, in return I’ll attack her.” Or, “If you don’t attack me, I’ll split the tie in your favour.” It might be phrased differently, but essentially it boils down to one-shot deals, rather than a lasting relationship. First you have a basic Upkeep phase. Flip cards up, heal gladiators, that sort of thing. The main thing here is that you get 1 gold per slave, and pay 1 gold per gladiator. So get enough slaves, and you have an income. Have too many Gladiators, and you end up having to pay an upkeep cost. You’d think getting together a tidy economy here would be key to the game, but as I’ll explain shortly – that’s not really the case. Next is the Market phase. This allows you to trade things with other players (like gladiators, weapons, slaves, or guard) but more importantly an auction takes place. This is where most new items are added to the board (slaves, gladiators, etc.) The auction is a fairly classic blind-auction. You put gold into your fist, and when everyone is ready, you open your palm and whoever bid the highest gets the item. Every round one of the items up for auction is the “host” token, which allows you to host the gladiatorial battle. Lastly is the Arena phase. In this phase the host invites two players (potentially himself) to send gladiators to fight in the arena. It’s a fun combat system and the way it ties into all the other phases of the game is pretty clever. It more or less ties to the Intrigue phase seemingly overshadowing all other phases. For example, if you get really good, late in the game, you might have an income from your slaves of 6 gold. More likely it’ll be closer to breaking even, or 2 or 3 gold. In the Intrigue phase, you regularly get cards that just flat-out give you money. Looting the Dead gives 3 gold, just like that. Joint Venture gives 7 (admittedly you have to cajole another player to help you, and that usually means splitting the gold.) So it is pretty easy for the money you make in the Intrigue phase to vastly over-shadow the money from the other phases. The same goes for influence. Being the host of the Arena phase gives 1 influence. Winning the gladiatorial battle gives you another. So potentially you can get 2 influence in a turn. Or… in the influence phase you might just pick up a card that gives you 2 influence. Or even 2 cards that give 1 influence each. Which means you could easily get between 0 and get 3 influence just like that. It’s all pretty easy to do – it’s not uncommon for someone who is well behind on influence to suddenly shoot up 3 influence in the intrigue phase. After the first game, I realised that Spartacus can suffer from “bash the leader.” As soon as someone gets to 10 or 11 influence (12 needed for the win) you can expect everyone to start targeting you. I later realised this was the point of guards – discard one and you have a 50% chance of foiling schemes targeting you. That means if you can get a nice stock pile of guards, you become largely immune to last-minute attempts to bash your influence off 12. So how do you get guards? … You draw them randomly from the Intrigue deck. My brother ran into a problem of several +influence cards early in the game, and not enough guards. This made him an easy target. You can buy guards off other players, but his fortunes with treasure was largely prone to the whims of the intrigue phase as well. The problem is if someone gets a good balance of gold, influence and guards from the intrigue deck they have a significant advantage over everyone else in all stages of the game. I don’t really like Euro games’ complete eschewing of randomness, but being largely dictated by it is no good either. 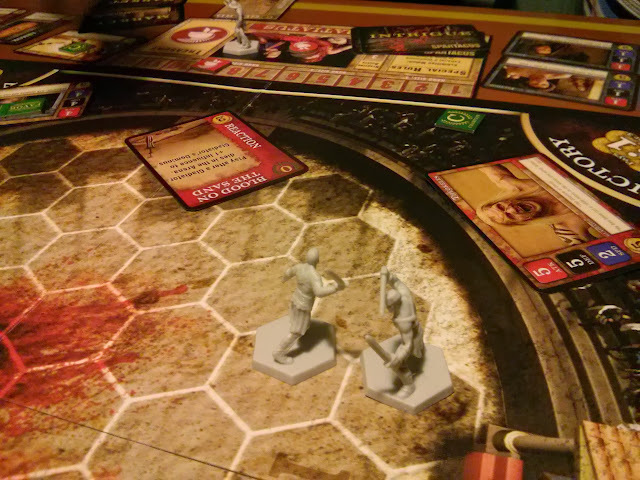 Spartacus treads mighty close to the line that differentiates between a luck-based game, and a strategic one. Also, it takes a really long time. Yes, the “quick” game is faster, but having tried both, standard is much better balanced. It was obvious that the mechanics are designed around this sort of game… but it requires a lot of work to keep the game running quickly. For my group it will be pulled out again, for sure, but we will have to be ready to commit an afternoon and evening to it.